Shamsul Mulk, the daughter of Mirza Ali Muhammad Nizam ad-Dawla, the grandson of Muhammad Hussain Khan Ispahani, the Prime Minister of Shah Fateh Ali Qajar (d. 1250/1834) of Iran; was born in Ispahan. Khurshid Kulah, the mother of Shamsul Mulk was the daughter of Shah Fateh Ali through one of his queens, Taj ad-Dawla Ispahani by name. Lady Ali Shah was thus related to the Iranian royal family through her mother. Queen Taj ad-Dawla was educated under the care of Motamid ad-Dawla Abdul Wahab Khan Nishat Ispahani, an eminent scholar of her time and her daughter and grand-daughter were equally recipients of a select and high education. The Aga Khan II had married Shamsul Mulk in 1867, who became known as Lady Ali Shah. Soon afterwards, they came to Karachi, where their son, Aga Khan III was born in 1877. She used to give names to the newly born babies in the Jamatkhana mostly in Karachi. It is worthwhile to illustrate that on December 25, 1876 a child was born in Karachi in Poonja family. The parent took him to Lady Ali Shah, who held court in the Kharadhar Jamatkhana. In keeping with Ismaili norms, Lady Ali Shah blessed the newly born child with the name of Mahomed Ali by alphabetizing the two words in English in the anglicised form. He was Mahomed Ali Jinnah, the founder of Pakistan, who, throughout his lifetime, adopted the same spelling of his name that was on the record of the Jamatkhana. Lady Ali Shah had been in Bombay in 1881 with her son on the death of the Aga Khan I, and then made her residency at Poona. 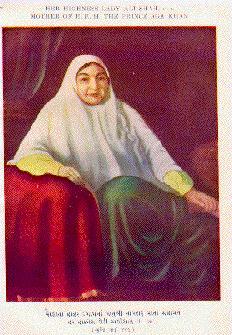 Lady Ali Shah took the reins of the Ismaili community affairs during the time his son ascended as 48th Imam, and she administered the affairs efficiently through a Council, consisting of the prominent members of Kutchh, Kathiawar, Gujrat and Sind, until the Aga Khan III attained puberty in 1893. Lady Ali Shah was indeed a benevolent woman, and famous for her charity and generosity, and her fame reached the fringes of the Muslim lands. In 1880, she had established a school in Karbala for the education and welfare of poor orphans of Sayed families. She also donated a land of 3000 square meters and constructed a building for the Iranian residents at Kazamain. In 1905, she had gone on pilgrimage to Mecca, and on that occasion, she was lavishly charitable that the people forgot all that they had heard of the charities of persons of high rank. Lady Ali Shah gave a historical evidence in the Bombay High Court during the proceeding of Haji Bibi Case of 1908 before Justice Louis Pitman Russell, who was greatly struck by her evidence. As he observed in his judgement, she displayed an extraordinary memory. While the Aga Khan III was away from India during the World War (1914-1919), Lady Ali Shah was tremendously active in his stead. Reference has already been made to her command and ability for organization; she now developed this to the fullest extent by adding to her work of keeping in touch with the Ismaili community. She also placed her services at the disposal of Lord and Lady Willingdon and under her direction, the Ismaili and Iranian ladies rendered great services to the wounded soldiers brought to Bombay from Iraq during the first World War. Under her inspired leadership, the community was able to collect large funds and procured necessary supplies. She kept in constant correspondence with the ruler of Hunza and the influential Iranians, advising them to help the Britain during War. Her nephews and relatives fought on the side of the Allies in Iraq, and one of them notably was Aga Hamid Khan, who was ranked C.I.E. In 1917, His Majesty, the King was graciously pleased to grant Lady Willingdon the Order of the Crown of India. On that occasion, the historic house of the Aga Khan at Nesbit Road, Bombay was the scene of a very influential and picturesque gathering of the Muslim ladies, when an address of congratulation was presented to Lady Willingdon under the leadership of Lady Ali Shah. It was a unique gathering when she read the address to Lady Willingdon in Persian. She also had a nice meeting with Lady Wilson on February 9, 1924. On the recommendation of Lord Willingdon, the honour of the Imperial Order of the Crown of India was conferred upon Lady Ali Shah in 1932. She visited Beirut in the same year for treatment, where she was well received by the Syrians. She had also gone to Palestine, Damascus and other holy cities, and returned to Bombay on October 3, 1930. On November 30, 1930, she inaugurated the conference being presided by Lady Ghulam Hussain Hidayatullah at Poona, being attended by the Muslim ladies of Bombay and Sind. Being an ardent Iranian scholar and well grounded in oriental history, Lady Ali Shah was a woman of great piety. She was universally respected through the Muslim world. In 1934, she visited Syria with her grandson, Prince Aly S. Khan. When she had visited Iran, Reza Shah Pahlavi was the vizir and commander-in-chief. By his order, she was accorded warm welcome befitting a grand-daughter of Shah Fateh Ali. He presented her two Iranian carpets, which she gifted to His Highness of Dharampur. Lady Ali Shah encouraged the Ismaili girls to take education and it was through her influence that the social reforms were introduced in the community. So profound was her wisdom and so great the confidence in the soundness of her opinion that several Indian princes sought her advices. The Begum of Bhopal was an intimate friend of Lady Ali Shah. She also came in close contact with Lord Reay and other governors and their wives, and also with the Earl of Dufferin and the Countess of Dufferin, who entertained a very high opinion of her. In 1934, she intended to visit Iran after meeting with Lord and Lady Willingdon at Karachi, but her sudden illness prevented her to make tour, and under medical advice, she made a second visit to Europe. Despite her impairing health, she continued to serve the community. She had an honour to inaugurate the All India Golden Jubilee Committee on October 16, 1935 at Bombay. Lady Aly Shah was taken seriously ill in November, 1937. The Aga Khan III hurried to India by air and landed at Jodhpur, and after greeting His Highness Maharaja Umedsinhji, he left for Bombay by train. As doctor had anticipated, his presence acted as a tonic on Lady Ali Shah and she recovered from the serious illness. She left for Iraq in January, 1938. She proceeded to Baghdad via Karachi and Basra by S.S. Vasna which sailed from Bombay on January 27, 1938. She, realizing that her end was near, told to Kamadia Khan Bahadur: "Send my love to all the members of the Ismaili community. I may not return to India, but wherever my spirit be I will eternally watch their peaceful progress and prosperity, as I have done all my life." The Aga Khan III had made every arrangement for his mother's comfort at Baghdad, and for that reason, he took with him Kamadia Khan Bahadur's son, Hussain Ali, by air to Basra, where, under Aga Khan's instructions, he made all possible arrangements for a quiet landing. A saloon car was ready to convey Lady Ali Shah from Basra to Baghdad, where a bungalow, belonging to her nephew, Aga Hamid Khan, was placed at her disposal. She arrived at Baghdad on February 4, 1938 at 1 pm. True indeed it is, that the Aga Khan III's association with the West increased, causing his longer stay away from India. His mother had felt the pangs of this separation, and once she said to her son: "Death is inevitable, but if it comes to me in your absence, it will be unendurable." The Aga Khan's reply brought her great solace, who said: "Do not worry. You will breathe your last with your head in my lap." Consequently, the Aga Khan III and his wife reached Baghdad by air from Cairo on February 5, 1938 at 3 pm., and Lady Ali Shah passed away at 5.15 pm on the same day, breathing her last in the lap of her son. She was buried on the evening of February 6, 1938 at Najaf next to the tomb of her husband as per her will in presence of thousands of people. Her death occasioned deep grief not only among the Muslims, but in all other communities in India among whom she was very popular. Reference to her death was made at the meeting of Bombay Municipal Corporation on Monday, the February 7, 1938 and as a mark of respect to her memory, the House adjourned without transacting any business. In the course of an intimate sketch of her life, the "Daily Mail" of London published the following description of her, only a few days before her death. "For all her burden of years, she is still one of the most vital personalities in India; clear thinking, forth-right, imperious - a strict warden of the past, who sees little that is worthy or desirable in the fruits of the present." "I do not mingle with the world of today, but I am not ignorant of it," she has often said. "Her physical vitality has been as remarkable as her strength of mind. In her home she wears always the silken trousers and soft draperies such as the women of Persia wore centuries ago. And although that home is a palace famed for its splendour, her way of life has been as simple as that of the humblest of the Prophet's followers. Her fare is frugal, her drink water. She fasts." The Aga Khan III was deeply affected by the death of his dear mother. "In this difficult and saddest moment of my life", wrote the Aga Khan to a friend, "the consolation I have is that the sadness and sorrow is tempered by the fact that she lived to be, at least 90 years of age. She had a large and happy family and very happy grand-children whom she always wanted. She died where she wanted to die. She had the satisfaction of seeing her grand- children happy and prosperous in day when prosperity is getting rare. But all this does not reconcile me to losing her. She had been to me more than father and mother combined, since I lost my father at the age of 8. No loss, not even that of my son who died in infancy which was a terrible blow to me as a father, has been quite so terrible as this." Such was the deep affection between the Aga Khan and his mother. To mark his devotion, he had heretofore dedicated his book "India in Transition" to his beloved mother in 1918.